No, I don't mean seconds of time, or asking for seconds during a Thanksgiving dinner, sealing the deal for the upcoming food coma. There's something to be said for people being second at something. 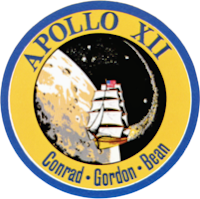 Yesterday was the 40th anniversary of Apollo 12. It was the second landing on the moon, and after the legendary "That's one small step for man, one giant leap for mankind" spoken by Neil Armstrong after becoming the first person to ever set foot on ground that's not Earth, Astronaut Charles Conrad Jr. said "Whoopee! Man, that may have been a small one for Neil, but that's a long one for me. ", after making a bet with a journalist that what he said wasn't scripted by NASA. Was it less epic or important than Apollo 11? I don't think so. Apollo 12 actually achieved what Apollo 11 didn't - a much more precise landing, for example.